October 14, The Iran Project – New ambassador of South Africa meets Zarif; IRGC military drill around Shaho Mountain; Larijani departs for Antalya to attend Eurasian parliamentary conf. ; ‘Konarak’ missile launcher warship joins Iran Army’s Naval fleet; Fresh from one fight at ICJ, Iran takes on America in another; 3rd meeting of Eurasian parliaments’ speakers kicks off in Turkey; World must confront US threats to global order, Iran tells UN; 9th meeting of Iran police with foreign ambassadors; German ambassador summoned over extradition of Iranian diplomat to Belgium; All govt. branches must join forces to confront US bans, solve economic issues: Leader; Int’l conference for promoting Persian literature kicks off in Shiraz; Iran among top seven powers in military drone industry: Top General; Iran interior minister in Turkey for security talks and Pre. Rouhani starts new academic year are among major headlines dominated the country’s media outlets in the past week ( October 08– October 14). The newly-elected president to Iraq, Barham Salih, has stressed his country’s resolve to expand relations and cooperation with the Islamic Republic of Iran. Tehran wants to overturn a US court’s 2016 decision to hand over millions in frozen Iranian funds to American families of victims of attacks attributed to Iran. The third meeting of Speakers of Eurasian Countries’ Parliaments has kicked off in Turkey’s Antalya, with parliamentary heads and delegations from 38 countries, including Iran, in attendance. Iranian Parliament Speaker Ali Larijani rebuked the United States’ aggressive policies, saying that the US’ unilateral approaches are the reason behind the current global issues. Turkey, Russia and Iran managed to prevent a crisis in Syria’s Idlib, Turkish Parliament Speaker Binali Yildirim said on Oct. 9, Turkish media reported. Iran’s Defense Minister Brigadier General Amir Hatami said the country is developing a new homegrown jet trainer, dubbed Kowsar-88. In a meeting with Qatari Parliament Speaker on Tue., Ali Larijani said that all people in the world seek to have their own way of living, dismissing as ineffective any kind of hegemonic policies in today’s world. 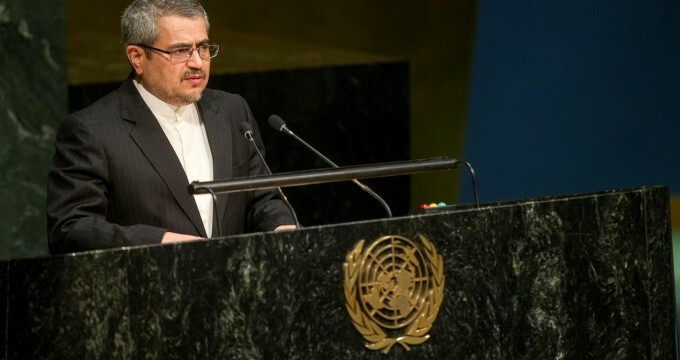 Iran’s UN envoy has called US withdrawal from the Iran Deal and re-imposition of sanctions against the country a serious threat against the UN Charter urging the international community to take a decisive reaction against Washington’s threats. Iranian Interior minister Abdolreza Rahmani Fazli has travelled to Ankara at the head of a high-ranking political delegation to meet with Turkish officials and discuss security issues. The high-ranking delegations of Iran and Turkey held a meeting in Ankara on Thursday, chaired by Iranian Interior Minister Abdolreza Rahmani Fazli and his Turkish counterpart Süleyman Soylu. Iranian President Hassan Rouhani participated in a ceremony at Tehran University to mark the start of the academic year. Leader of Islamic Revolution Ayatollah Khamenei called for practical and serious measures to solve the country’s major economic issues, including those related to banking system, employment, inflation and liquidity. The Hague-based International Court of Justice (ICJ) on Friday ended hearing the US lawyers’ defense against the lawsuit filed against the country by Iran. Some senior financial executives from Europe have reportedly met in on the sidelines of the annual meeting of the International Monetary Fund (IMF) and World Bank in Bali, Indonesia, to discuss the effect of US sanctions on doing business with Iran, news sources report. Syrian President Bashar al-Assad says the northwestern province of Idlib will finally return to government control along with other territories, which are still in the hands of foreign-backed militants. Lebanese Prime Minister-designate Saad Hariri says all political sides have made concessions on their demands for posts in the next Cabinet, expressing hope that a new government would be formed after President Michel Aoun returns from a trip abroad. Spokesman for the headquarters of Arbaeen said that 1,600 foreign and domestic correspondents and 400 television networks from 43 countries cover the great and spiritual ritual of Arbaeen. The US Senate approved two bills that clear the way for new sanctions against the Lebanese resistance movement, Hezbollah. The US-led coalition purportedly fighting the Daesh Takfiri terrorist group has reportedly dropped internationally-banned white phosphorus bombs on Syria’s troubled eastern province of Dayr al-Zawr. The Council of Ministers convened on Wednesday and approved allocating 90 billion rials of credit for repairing damages made by the recent floods in Gilan, Mazandaran, Golestan and North Khorasan provinces. IRGC will establish ten field hospitals to provide medical services to Arbaeen pilgrims, said 2nd Brigadier General Ahmad Abdollahi, the Islamic Revolutionary Guard Corps’ deputy commander for health, rescue, treatment, and medical education. The 11th edition of the Nanotechnology Exhibition, also known as Iran Nano 2018, has kicked off in the Iranian capital of Tehran with the participation of 160 institutions.